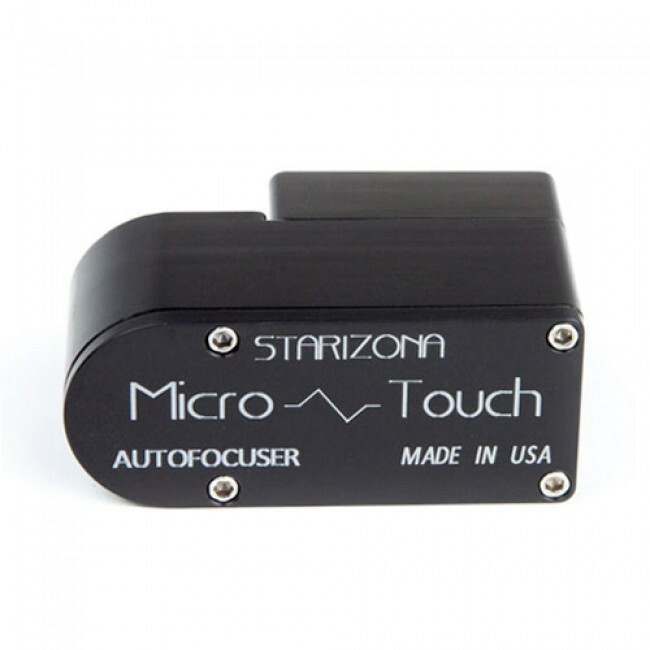 Starizona is pleased to announce a new, low-profile motor for our popular MicroTouch Autofocuser. The MicroTouch works with any Feathertouch Focuser from Starlight Instruments. This new motor is designed to fit any of the Feathertouch SCT MicroFocusers* or any 2" Feathertouch Crayford focuser. * Will not fit the Feathertouch SCT MicroFocuser for the original C14 due to the reversible collar. It will work with Edge HD C14s. The design is especially useful with Schmidt-Cassegrain telescopes and the Feathertouch SCT MicroFocuser. The SCT MicroFocuser is a retrofit accessory that gives a smooth, 10:1 fine focus for the primary mirror of any SCT. The previous MicroTouch focus motor was in line with the axis of the focuser, which made it protrude out farther from the back of the telescope, potentially interfering with a camera or other accessories. The new low-profile MicroTouch motor gives an extra inch of clearance by moving the motor off-axis. The motor housing can be clamped down in any orientation; it is shown sticking down in the image below, which puts the motor cable plug straight down as well. The new low-profile motor retains the precision of the previous motor, including the 300 steps per turn of the fine-focus knob (3000 steps per turn of the coarse focus knob). Any previous MicroTouch controller can be upgraded to the new low-profile motor, and all new MicroTouch units for use with SCT MicroFocusers come standard with the low-profile motor. Overall dimensions: 2.89" x 1.77" x 1.23"